It’s easy to do. We’ve all gone overboard during Oktoberfest. You decided to head out for the festivities solo. Everywhere you turn, there are tasty beers on tap. People are handing you bratwurst and sauerkraut faster than you can say, “Ziggy zoggy, ziggy zoggy, oy, oy, oy!” Before you know it, you’re doing polka dances on the table at 4 A.M. with some guy named Klaus that you met just 2 hours ago at. That’s the exact moment that you realize that you may have gone a little a little too extreme this year! You might just need a new game-plan to keep the night under control this time. That’s why we’re recommending the buddy system. Yes, before you head off to Oktoberfest, you need to grab another friend to stay with you during the festivities. 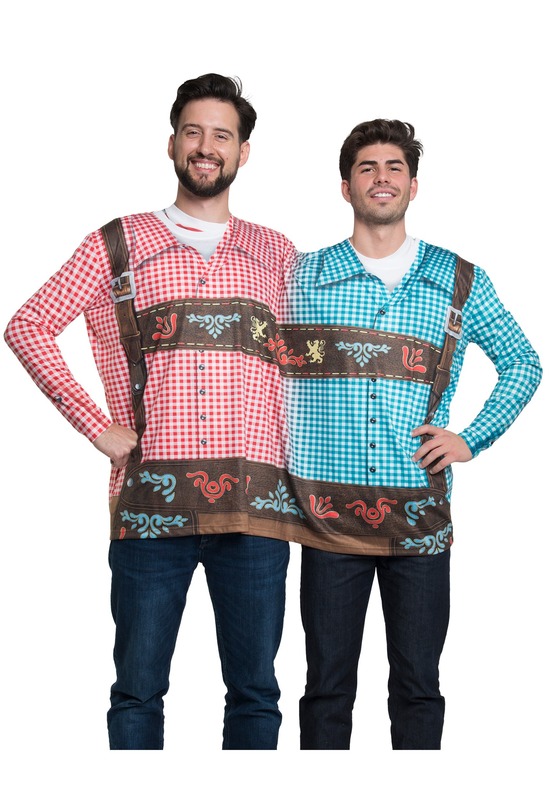 Of course, you’re going to need a little insurance to make sure that you don’t get separated from your buddy, which is why this Oktoberfest 2 Person t-shirt is great! This novelty long sleeve shirt is designed for anyone trying to employ the buddy system during Oktoberfest. Its simple design makes it nearly impossible for you to get separated from your drinking buddy, since you’ll literally be wearing the same shirt together. One half of the shirt is a red plaid design and the other is a blue plaid design. Each side also has printed lederhosen on the front to help you get a festive Oktoberfest look. 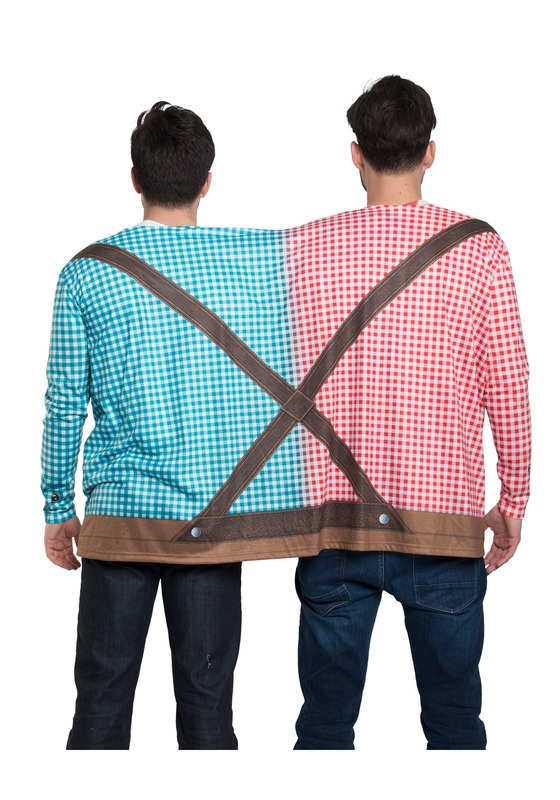 This 2 person shirt is the easiest way to keep track of your best buddy during the crazy times of Oktoberfest. Just wear it with your favorite pair of jeans and go grab a pint of lager with your best pal. Of course, you two can always accessorize this look with some of our Bavarian themed hats to complete the look… and say hi to Klaus if you happen to bump into him this year!